The ancestry of groups of species can be deduced by comparing their base or amino acid sequences. The sequences for alpha and beta hemoglobin are known for humans, chimpanzees, and gorillas. Humans and chimpanzees have identical alpha and beta sequences from which gorillas differ by only one residue in each chain. On position 23 on the alpha hemoglobin, for example, gorillas have the amino acid aspartic acid instead of glutamic acid and at position 104 on beta hemoglobin gorillas have lysine instead of arginine. 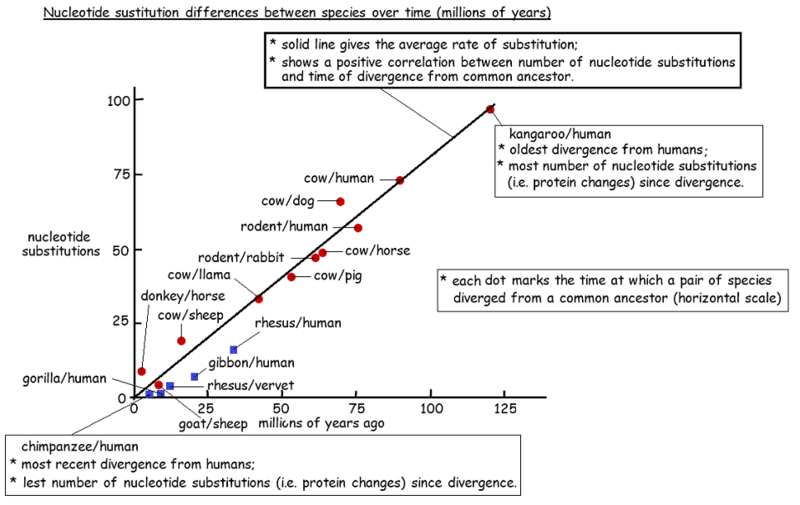 Outline the use of a “molecular clock” to determine time since divergence between two species. 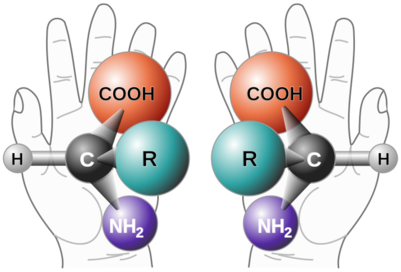 State the source of differences between biological sequences (nitrogenous base or amino acid). Hemoglobin changes at a regular rate over hundreds of millions of years, acting as a molecular clock. A variety of proteins have been studied, each producing its own molecular clock. Histones (organize DNA) hardly change at all. Cytochrome c (a mitochondrial protein) changes slowly. Hemoglobin (blood protein) changes moderately. Fibrinopeptides (clotting proteins) change rapidly. Contrast analogous and homologous traits. State an example of analogous and homologous traits. Outline how computer programs analyze biological sequence data to create cladograms. Identify members of clades given a cladogram. 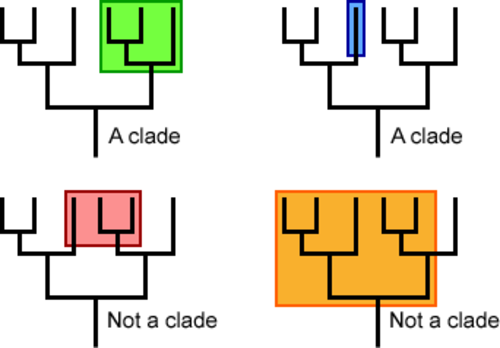 Cladograms are tree diagrams where each branch point represents the splitting of two new groups from a common ancestor. 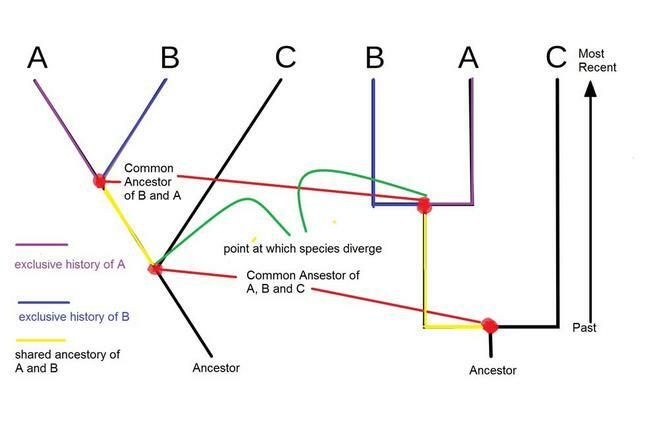 Each branch point (node) represents a speciation event by which distinct species are formed via divergent evolution. 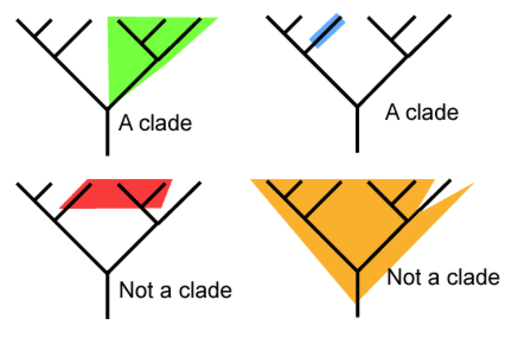 Cladograms show the probable sequence of divergence and hence demonstrate the likely evolutionary history (phylogeny) of a clade. The fewer the number of nodes between two groups the more closely related they are expected to be. Outline the role of technological advancements in the development of cladistics. Explain why the development of cladistics lead to the reclassification of some species. The classification of many groups has been re-examined using cladograms. 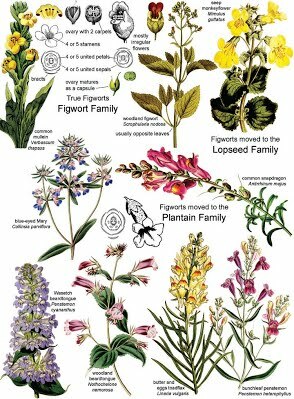 ​Until recently, figworts were the 8th largest family of flowering plants (angiosperms), containing 275 different genera. This was problematic as many of the figwort plants were too dissimilar in structure to function as a meaningful grouping. 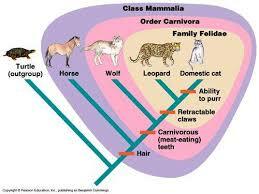 Analyze a cladogram to explain the evolutionary relationship between species. Discuss the use of cladograms as hypotheses of evolutionary relationships. ​These are some pictures outlining which part of a cladogram is a clade and another picture I created on ancestry using a cladogram. The red dots are called nodes, and represent the time when two species are estimated to have split. One thing to note, just because a species like C split earlier than from B, it does not mean that B has evolved more. All the species at the top are present D species. The ones that have died out or changed would be at the nodes. ​Create your own cladogram that contains at least 8 organisms using biochemical evidence such as DNA, Protein similarities or immunological studies. By providing a chronicle of past evolutionary events, phylogenetic trees have become central to understanding the process of evolution, and therefore to the interpretation of all biological information. Phylogenetic comparisons with model organisms (such as the chimpanzee, mouse, zebra fish, and yeast) are providing major insights into the structure and function of the human genome, knowledge that will enable us to address a wide variety of human disorders. ​Using newts, coyotes and mice, Jason Munshi-South shows how animals develop genetic differences in evolution, even within an urban city.